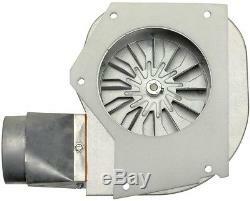 Englander Pellet Stove 85 CFM Combustion Replacement Exhaust Blower Fan Assembly. The Englander 85 CFM Combustion Exhaust Blower fits Englander pellet stoves and provides forced air (negative draft) that keeps the flame burning, while allowing you to set your heat range to your desired comfort level. A complete assembly with gasket and pipe adaptor included, this replacement exhaust blower is not compatible with Englander model 25-PUF or the Englander 10 CPM multi-fuel stove. Simple to install with wire leads for fast "plug and play" installation, detailed step-by-step instructions are included to help guide you through the install. Durable construction for long-lasting and reliable use. Replaces existing combustion exhaust blower on Englander pellet stoves. Complete assembly with gasket and pipe adapter included. Includes wire leads for fast "plug and play" installation. Includes detailed step-by-step installation instructions or you may reference the DVD that was included with your unit. Not compatible with Englander model 25-PUF or 10 CPM multi-fuel stove. One year on electrical components. Please pay as soon as possible after purchasing your item, as that will allow us to post your item to you sooner! We will provide you with tracking information at the time your item ships. We Are Here To Help. --Durable construction for long-lasting and reliable use ---Replaces existing combustion exhaust blower on Englander pellet stoves ---Complete assembly with gasket and pipe adapter included ---Includes wire leads for fast "plug and play" installation ---Includes detailed step-by-step installation instructions or you may reference the DVD that was included with your unit ---Not compatible with Englander model 25-PUF or 10 CPM multi-fuel stove Dimensions Product Depth in. 5.5 Product Height in. 8.625 Product Width in. 10.625 Details Accessory Type Fireplace Blower Product Weight lb. 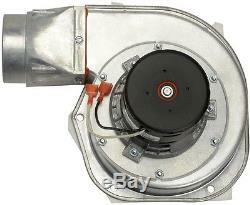 The item "Englander Pellet Stove 85 CFM Combustion Replacement Exhaust Blower Fan Assembly" is in sale since Saturday, February 4, 2017. This item is in the category "Home & Garden\Home Improvement\Heating, Cooling & Air\Fireplaces & Stoves\Replacement Parts". The seller is "intek_solutions" and is located in Washington, Illinois.